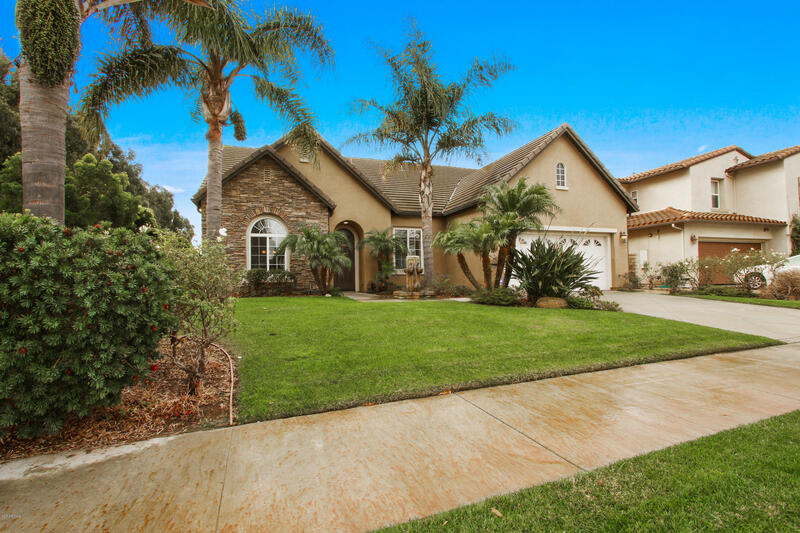 Stunning, modern 2003 built single story home in gated North Oxnard Victoria Estates! This beauty has numerous quality features & special details. HOA has outdoor pool area, clubhouse/exercise gym. Over 2450sf - 3 bedrooms + den/office, 2.5 bathrooms, living room & dining room, family room w/gas fireplace, interior laundry room and oversized garage. Spacious Master bedroom & spa-like bath has jetted tub & huge walk-in closet. Many features include: 10' ceilings w/fire sprinklers; kitchen counters & backsplash are Chocolate Bordeaux Granite, stainless appliances include a Bosch dishwasher, 5-burner gas range, microwave, convection oven, dual stainless sinks in island bar; informal eating area w/sliding door to outside covered patio, backyard greenhouse & BBQ/ fountain/seating areas. Whole house water filtration. Flooring is upgraded travertine tile & vinyl plank; A/C & Heating filtration system, beautiful window shutters; Crown-molding, bedroom ceiling fans & closet organizers; Office has custom built-in shelving & sliding barn door off entry; Dehumidifiers in baths; Family room has gas fireplace on switch; Laundry room with sink; Garage has ample shelving & floor coating. DON'T MISS THIS GORGEOUS HOME!